Two of the biggest complaints about the 1911 are that you have to push the safety off to do anything with the gun, and the grip safety can be problematic. A new pistol made by Wayne Novak solves those problems. The pistol in question is an all-stainless or blued-steel Government model in .45 ACP. While the basic parts are made by Colt, the Novak Custom Shop takes it from there. The Novak shop mills the slide for its own sights with a fixed rear and a front blade with a gold bead insert, and then the 'smiths install a Kart National Match barrel. The slide and frame get dehorned, and the frontstrap gets a very nice 25-lpi checkering treatment. The frontstrap is also lifted at the junction of the frontstrap and trigger guard, and the trigger itself is a solid aluminum unit, set with the Commander hammer to be a clean, crisp 41â'„2 pounds. The thumb safety on this one is a single-side only, but if you ask you can get an ambidextrous thumb safety. The big deals on the NeXt model concern the thumb safety and the grip safety. At first glance the grip safety is simply an Ed Brown-shaped grip safety with a high hand location. However, a closer examination reveals a lack of a certain something: There's no gap between the grip safety proper and the mainspring housing. It is the Novak Answer installation. The mainspring housing is flat (you can get an arched one) and checkered to match the frontstrap. However, as the whole thing is one unit, the grip safety does not work as a safety. The horror. The Novak NeXt does away with some extra parts and a complication for some of us with large but slender hands. No need to squirm your grip to ensure the grip safety works, just draw and proceed. Now, this won't pass muster in some circles. It won't make the grade for IDPA, for instance, so don't show up at one of its matches with one. The other change is on the thumb safety and the slide where the thumb safety bears against it. Novak relieved the slide along the length that would bear on the thumb safety and also relieved the thumb safety to clear the slide. This is the Novak NeXt safety system. Now, while the grip safety may be controversial in some circles, this change is one that should have been immediately adopted by all and hailed as a step forward. Simply put, what the change means is this: You can work the slide even with the thumb safety engaged. You can load, unload, do a press check, even begin disassembly proceedings, all with the safety securely locked in the upward, safe position. Let me repeat that: You can load and unload with the safety on. With this simple change, Novak has made the 1911 as modern as any defensive sidearm currently in use. The modification entails milling the edge of the slide on the right side, from the notch for a standard safety to a point halfway between the cocking serrations and the takedown notch in the slide. Also, the thumb safety itself is relieved slightly, so it and the slide can exist in peace and not lock horns over the slide's movement. Look Ma- no grip safety. Novak's modification does away with this sometimes-problematic 1911 design feature. The manual of arms ends up being a bit different. In all instances except when the hammer is down, you can move the safety to the safe position before doing anything and leave it there. Want to load? Assuming the hammer is down, work the slide and check the chamber. Then push the safety on, insert a loaded magazine, work the slide, remove the magazine and top off the magazine and lock it back into place. Want to do a chamber-check? Just ease the slide back, leaving the safety up. Want to unload? Drop the magazine and work the slide. How did the gun shoot? Pretty much as you'd expect from a hand-tuned custom gun. Shooting good groups at 25 yards was not at all difficult, thanks to a crisp trigger, great sights and properly fitted barrel. Feeding was utterly reliable. My test gun was a package pistol, but you can have these modifications made to most any 1911. Wayne Novak and the crew have been at this for a long time, so you are unlikely to present them with a problematic pistol to work on, unless you ship them a "mixmaster" parts gun for work. If that is your base gun, do yourself (and them) a favor and just order this one. 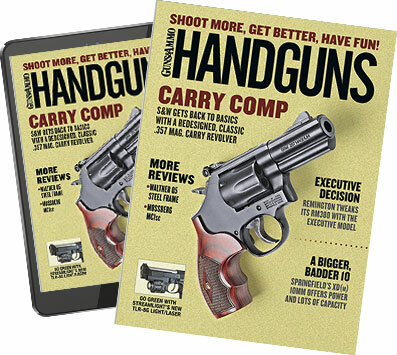 In what the author considers a major 1911 advancement, the Novak thumb safety does not have to be pushed to the fire position in order to work the slide.